A mere five dollars turned the career of Lloyd “Tiny” Grimes around completely. The singer and sometime pianist in his early twenties was playing semi-professionally in New York City in 1937 when he saw a four string guitar in a pawnshop window. The five dollars it cost was money well spent as within a few months he was widely acknowledged to be among the best guitarists around. He spent 1941 recording with Cats N’ The Fiddle, a highly respected jive group, then joined Art Tatum and Slam Stewart in a trio that was further expanding the possibilities of small jazz ensembles. But the iconoclastic, restless musician wasn’t as enamored with the innovations of bop as some of his compatriots were, despite his early forays into the style alongside alto sax legend Charlie Parker, and soon he was looking elsewhere for musical inspiration. 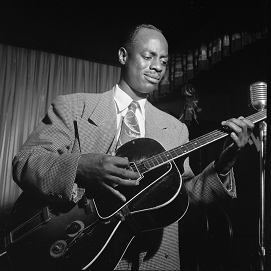 Signed to fledgling Atlantic Records in 1947 Grimes charted his own idiosyncratic course, largely forsaking jazz for rock ‘n’ roll, albeit a highly refined technically proficient version of rock. The next fall he scored Atlantic’s first official hit and put together an eclectic band of musicians he dubbed The Rockin’ Highlanders, which would at various points include such luminaries as sax star Red Prysock and pianist/singer Screamin’ Jay Hawkins. In addition to his own work he may (or may not – details are sketchy at times) have appeared on many other notable tracks by artists through the years which further shaped the rock sound. Grimes own musical directions were always far-flung and he veered between styles incessantly, cutting jazz, blues, pop and rock (often a combination of them within the same performance) with little premeditated planning, making his catalog frustrating for those seeking a singular sound, but also illuminating for those interested in seeing how it all could be tied together under the leadership of a brilliant non-conformist. When Prysock went out on his own and took most of Grimes’ other musicians with him in the mid-1950’s, Tiny retreated to jazz where his skills complimented the likes of Coleman Hawkins and others in small combos on record, well-respected by other musicians and the more astute fans of the idiom. Because his musical choices were so eccentric over the years his legacy in any one area, including rock, has been viewed as historically notable mostly for those he played with, but the unifying factor between the extremes of Charlie Parker and Screamin’ Jay Hawkins was Grimes, an artist who followed his own peculiar muse wherever it led. For awhile at least it led to rock ‘n’ roll where some of his best work was done.